This is one complete meal you'll savor from start to finish. 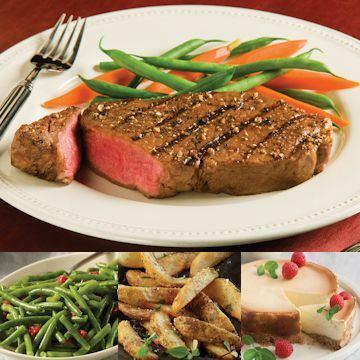 Savor the bold, beefy flavor of an New York Strip Steaks, served with a delicious Natural Steak Seasoning that perfectly compliments the flavor of your meal. With a generous side of seasoned Steakhouse Fries and delicious green beans. Meal serves 4. Do Not Thaw! Oven: Preheat oven to 450°F. Line a baking sheet with parchment paper or aluminum foil and lightly oil. Remove Omaha Steakhouse fries from packaging and distribute on the baking sheet leaving space between fries. Place baking sheet in oven on center rack. Bake for 18-20 minutes. Grill: Preheat grill to medium. Remove Omaha Steakhouse Fries from plastic packaging and place on a perforated grilling pan. Heat over grill for 15-20 minutes, stirring constantly.